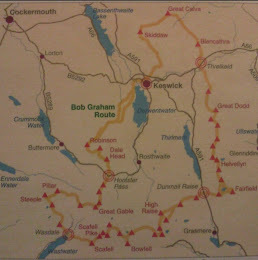 Originally started in 2011 for the run up, and successful completion of the Bob Graham Round. I have continued to update my running exploits. Including the very recent UTMB race 2013. Just an ordinary Bloke who loves been out in the mountains in any conditions. This is my way or sharing my experiences and giving my verdict on kit I use and abuse. I came up with this idea last year, and even bought the Harvey 1:40000 map that covers the whole route. The problem was when and where I was going to fit it in and at what time of year. So far for 2013, I had the Dark Mountains, Fellsman, Montane 50, and UTMB scheduled for the year. The only real gap and to use it as useful training was going to be end of February, beginning of March, to give a good recovery period before the Fellsman. This run was planned just for myself and Dave Dixon with some planned stops for water and food. From the start at Ilkley we would run to Grassington, with a water top in-between. Then Grassington to Beckermonds, with a water top up. Beckermonds to Dent, with a water top up. Dent to above Kendal A6 crossing, with a water stop in-between. Then the last leg A6 crossing to Bowness finish, again with a water top up in-between. The maximum time I was allowing at the main stops was 10 minutes, with just a few minutes to take on water, or top water bottles up. 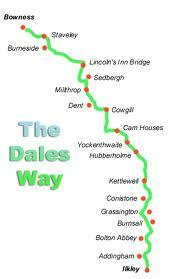 Depending on which information you read the Dalesway seems to be between 81 to 84 miles. So I worked out a schedule that was a 4 mph pace on average for the whole route. Only thing to do now, was to wait for the day to arrive and some half descent weather, especially after the Dark Mountains race! Arriving at Ilkley forty minutes before the 12:00 start gave us plenty of time to take on the day ahead. Dave's mum was there for the set off and was going to drive the car to the first water stop. As the clock turned 12:00 we were off on the first leg which follows the river Wharfe all the way to Grassington. Here the trick was to settle into a nice steady rhythm and not get carried away, and ensure we didn't divert off the route over the wrong style, as they were plenty of them. The weather was perfect, cloudy and dry and not too cold. I was happy to hear my first Curlew this year, a sign of spring was round the corner. Time past without any problems and Addingham seem to come and go before we were running under the A59 on to the old stone bridge and on the Bolton Abbey Estate. Passing the Abbey and over the footbridge back on to good solid paths to the Cavendish Pavilion and back on to the left hand side of the Wharfe and in to Strid woods. From the start I was surprised at the amount of walkers about on a Friday afternoon, quite busy. Past the Strid which looked quite tame for the good dry spell that we have had a while. Crossing the Wharfe again over the stone bridge we were in sight of Barden bridge and a planned water stop and top up. A quick stop at the bridge and me and Dave had settled nicely into what so far was all runnable from the start. The next part went great, passing Howgill and turning back onto the Wharfe towards Appletreewick. The paths so far were surprisingly dry which made great running. We were soon at Burnsall and crossing the Wharfe again to run past the Red lion pub and back along the left hand side of the Wharfe passing Loup Scar an Impressive outcrop of Limestone. The weather had improved and in places there was blue sky and the Sun was threatening to join us. The running was steady and good and Im sure we were managing to put the world to rights as we travelled, oh and gat and style counting! Soon we were over the suspension bridge and Grassington wasn't far away at all, this leg seemed allot shorter than it did on paper. Linton Falls and our first view of Grassington bridge. Up through the houses and up on to Chapel Street, and our support crew would hopefully be waiting at the start of Back lane. Met By a very enthusiastic Sid and Sandra and Daves mum we had our first warm brew and sandwich. We were up 40 minutes from my Schedule estimate, and we both felt good after doing the first 16-17 miles. Only problem was that Cathy Bradley was going to run with us from Grassington, but were early. Once fuelled we were off on our leg 2 and we were joined with Sid. We had our first proper climb of the day so far up onto Lea Green, which is easily runnable with fresh legs, and the nice gentle path that traverses this section quite away from the River Wharfe. Now we were above Conistone on past the well named Conistone Pie to very good running until we dropped down past Scargill House on to a small tarmac section. Which we stayed on all the way to Kettlewell, to meet the support crew in the car park and also to meet up with Cathy, who was going to run with us to Dent. A quick top up and we were off back over the wharf and to follow the river on the Left had side all the way to Buckden. In the valley floor we were treated to around 30 - 40 Oyster Catchers which was nice to see on the 1st March. This section was full of wildlife as we spotted a couple of young Deer not far from us just to the side and then there were more dear, and little further on more running towards Firth Gill. I think we counted nine in total. Passing through Buckden the sky was starting to fade and the night sky wasnt' far away. Fortunately we asked the support crew to meet us at Yockenthwaite, which was a good call as we needed our head torches to get us to the official stop, at Beckermonds. Back over the wharfe and on towards Deep dale which took us back over the wharfe on to the left hand side of the wharfe up the top end of Langstrothdale (one of my favourite areas of the dales). In front we could see the lights of Beckermonds and our foot bridge to finally leave the Wharfe behind for good to the end of leg 2. Food stop number two and around 29- 30 miles of running completed. This is where we said good bye to Sid for is company all the way from Grassington. The next section saw the start of a climb up out of Oughtershaw to the track that leads past Nethergill and Swarthgill up to Cam Houses, including a very spooky looking end cottage which at night didn't look inviting and spurred us on to quickly do the last climb on to the Cam High road and the Highest part of the Dalesway route. Good running now on the track. The stars above were amazing, not a cloud in the sky and it was easy to make out the shapes of Penyghent and Ingleborough in the distance. The track led us towards Ribblehead, the train station with it Christmas lights on, well thats what they looked like. Up to Gearstones and a quick top up with water from our support crew and we were climbing up Winshaw and traversing over to the Black Rake road to join the tarmac road down to Dent Viaduct. The road was icy in places which made the descent interesting! Now for the run along the longest tarmac section of the route and passing a very inviting Sportsman Inn and the front door was open beckoning us inside. But onwards through the next section which zig zags through fields. Cathy did a great job with the map over this complicated section, with a few missing way markers. We crossed over the river Dee, where we saw some deep water in a limestone trench which had a beautiful blue tint to it. Onwards and was Dent ever going to arrive. The section from the Viaduct to the village seem to take forever and I am sure someone was moving Dent towards Sedbergh! Following round the North East side of Dent after a few hundred meters, we met the road and it was the end of this long leg. Leg 3 complete, with around 46 miles in total and over half way. This is where Rachel was to take over the support duties from Sandra and Dave's mum What a great job they did in keeping us fueled up. This is where Cathy left us and what a fantastic job she did at keeping us going and some great map work too. The night air was getting colder and it was noticeable more colder down by the rivers. Running down the next few fields we were greeted with a couple of flashes, as Rachel had pulled over to take some photos where we crossed the road back on to the river bank. It was a good job Rachel stopped here, my hands were freezing and my warmer windstopper gloves were needed. Onwards and soon back on Tarmac, until we turned off back over the river and the climb up and over towards Milithrop. With good clear views of Silhouettes of Crook and Winder and the lights of Sedbergh below. We quickly turned to follow the river Rawthey to skirt Sedbergh before turning up towards Lincolns Inn Bridge and a water top up stop. We arrived and saw a sleeping Rachel in the car. A quick top up and we were away not wanting to cool down in this very chilly winters air. North following the river Lune up to the Crook of Lune bridge and turning, running south, parallel to the M6 motorway. Just over 1km and we crossed the M6 and back to more field and style hopping we crossed the railway line with the start of a Diversion on the Dalesway due to a footbridge at Thursgill that had been washed away last year. This meant over 2 miles of tarmac bashing but it only probably added a few hundred meters to the overall distance. It had now just gone 06:00 and there was light sky slowly appearing behind us. Great I had managed to do the night section without using a Caffeine gel. We dropped down a track with the A6 in front, and as we got towards the end of the track and we could see Rachel's car parked up. This time she saw our lights and greeted us at the end of this long leg and now we had completed around 65 miles and now we could get some food down, and for me the need to get some extra layers on, it was very cold. Off we went over the A6 to pick up a track and now we had left the head torches behind and day light was getting brighter. It was a cracking morning, clear blue skies and very frozen ground which didn't make running easy on the frozen divots. Good ankle strengthen exercise. Closing in on us was a very large smoking factory north of Burneside and we now picked up the River Kent to follow it all the way to Stavely. On to the road towards Stavely we turned off and under the railway track to the bridge that crosses the A591 and meet up with Rachel for our last water top up before the last few miles towards the finish at Bowness. The last few miles wern't going to let us get to the finish easily, the path climbed and turned left then right etc etc and Bowness just didn't seem to arrive quickly at all. The cloud was building quite quickly and we were lucky early on to get the best weather of the day. The ground was still very hard and the air was cold after the last few styles and more path turning. Lake Windermere was getting closer then next we seem to be running parallel with the lake and then, eventually we turned back towards the lake. Rachel met us 200m from the finish and followed us to, at last, the finish of the Dalesway and a very inviting stone bench..
Well what an outing, great company and we were lucky with the weather. It did feel very cold towards dawn but some fatigue and tiredness will have added to the lowering of our body core temperatures. I used a Garmin Fenix watch to track the full route and it was set on 'UltraTrac' setting which laid down a GPS point every 1 minute, so there will be a percentage loss in the full distance recorded. The statistics for this were 129km with 1697m of ascent. about 80.1 miles and 5566 feet of ascent our average pace was 6km/hour in a total time of 21:50 and with knocking the stops off 20:50 running time. Dave suffered with a groin problem which worsened towards the last 10 miles or so, I decided to play football with a large rock which caused a very sore toe and impressive blood blister. I also had problems with swollen tendons to my right lower shin area, but this didn't really come on until I stopped running. The Salomon S Lab XA Skin packs were really good, with excellent weight distribution and comfort. It was nice to have no rub point from a running pack. A big thanks Dave for an excellent run and for Rachel, Sandra, Cathy, Dave's Mum, and Sid for all there support and help which without there help we wouldn't have been able to complete without carrying everything for the whole route.